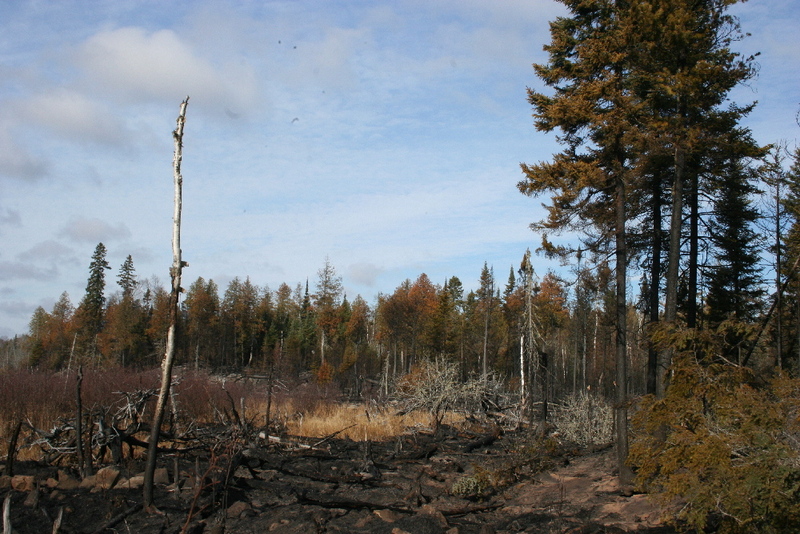 Gunflint Trail – During the week of October 17th the Gunflint District, U.S. Forest Services ignited the 1626 acres Meads and the 1963 acres Dawkins Lakes prescribed burns within the BWCA. Seven miles of the twenty-mile Banadad Ski Trail pass through these burns. Following the burns Banadad Trail Association members and volunteers were out in force clearing the Banadad Trail. Twenty-five volunteers, worked 250 hours, clearing over thirteen miles of trails, including the portion of the trail that ran through the Forest Service’s burn areas. Trail clearing work was coordinated with the Forest Service. Volunteers report only a one-third mile section along the trail suffered any major fire damage. On the remainder of the trail, only a few scattered small spot burns were found. According to the trail crews most of the trail was found to be in excellent shape. However, one crew did report that along side the trail a large beautiful area of old growth cedar just north of the 2000-foot burned-over area was destroyed by the fire. In addition to the Banadad Trail Association members, work crews included members of the Twin Cities North Star Ski Touring Club; North Star has helped maintain the trail for many years. Joining the volunteers on Saturday were two Forest Service crews charged with the responsibility of removing the down trees across the trail within the burn areas. Ten miles of the Banadad, the one-mile Tall Pines Trail and most of the three-mile Lace Lake Trail were cleared and pronounced ready for skiing. The Banadad Trail Association's Second Annual Meeting was held at Poplar Creek Guesthouse B&B in conjunction with the trail clearing. Officers elected at the Annual Meeting were Linda Bosma, Minneapolis, President, Andrew Jenks, Stillwater, Vice President, Kate Kelnburger, West Bearskin Lake, Treasurer, and Barbara Bottger, Hungry Jack Lake, Secretary. Rounding out this year’s Board as At-Large members are: John Bottger, Hungry Jack Lake; Wayne Monsen, Stillwater; Chris Matter, Hudson, Wisconsin; Peter Spink, Poplar Lake; Tom Rice, Minneapolis, Anne Rykken, St. Paul and Karla Miller, Duluth. Association members thanked Karen Monsen, the Association’s first president, for leading the organization through its initial two years. As part of the Annual Meeting’s program the Association’s web manager, Tom Rice, treated those presented to a slide show on the weekend’s trail clearing. Ending the meeting was an outrageously hilarious skit entitled “the Loony Divas” staged by two members of the Association. Following the meeting a potluck dinner was held. For additional information about Banadad Trail Association and the Trail go to www.banadad.org.